While I’ve had my head down, trying to push on with the first draft of a novel and developing a spinoff of Thoughts Like Birds (can blogs have spinoffs? ), I almost missed International Vulture Awareness Day. 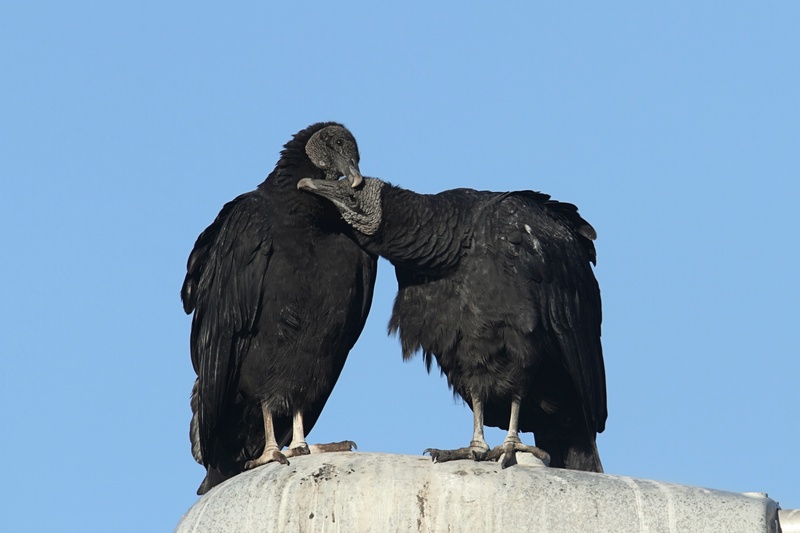 Vultures are near and dear to the augur’s heart and may (or may not) play a big role in the novel-in-progress–again, it’s a first draft, so it’s hard to say where it will end up. While I figure that out, I’m rerunning an excerpt from an old creative nonfiction project in which vultures do indeed feature prominently. Please be sure to check out the resources at the bottom of this page for more information on these remarkable and beautiful–yes, beautiful–birds. If you drive down Eubanks Road in Chapel Hill, North Carolina, of a beautiful sunny day, you are apt to notice vultures cruising the warm air thermals high overhead, drifting in an ever-widening gyre in search of some tasty, putrid morsel. Two species of New vultures share our ecological neck of the woods: the red-headed turkey vulture, Carthartes aura, and the less showy black vulture, Coragyps atratus. Both are inclined to loiter near a bit of roadkill, but black vultures, which can drive off the larger turkey vultures by virtue of tenacity and sheer numbers, tend to congregate around water. One morning I spied a row of black vultures on a fence surrounding a farmer’s pond, each perched on its own post, stretching and preening. What draws the vultures, both black and turkey, along with crows, starlings, grackles, and even daintier species such as dark-eyed juncos and song sparrows, to Eubanks Road, however, is the county landfill. As Ben Franklin championed the wild turkey, I have long lauded this ignoble bird and its crucial role as a scavenger. True, sanitation workers and undertakers now take on much of the vulture’s traditional workload, but these scavenging raptors still help us keep a clean nest by eating carrion both on and off road, accelerating the nutrient recycling process and keeping our environs considerably less fetid. Like many other non-human species, though, New and Old World vulture populations have declined due to development, environmental toxins, and reduced food supply. In India, the Parsi custom of placing the dead in towers for vultures to devour has been adversely affected by the waning number of birds. Vulture populations there have declined 97 percent in the past two decades, due, at least in part, to toxicity of domesticated animal carcasses caused by a common veterinary drug. A century ago the teeming birds could reduce a corpse to bones in a matter of minutes. Now, the odor from decomposing bodies and bits of human flesh dropped in heavily populated areas by the few remaining vultures are forcing Parsi Zoroastrians to consider cremation, believed to be a desecration of the element of fire, as an alternative. The first time I ever saw vultures up close I was driving from Silver Spring, Maryland, to Gettysburg, Pennsylvania, to staff a table on wildlife protection at a college environmental fair. As the borrowed Nissan pickup I was driving rattled along at the speed limit, I noticed the hunch-shouldered birds draped like black crepe among the bare branches of a large hardwood. It was my first time living away from home, out of state, in fact, and every new experience was a rapture. I pulled into a turnout a few yards ahead of the tree and got out of the truck. I realized then I was standing along side of the Gettysburg National Military Park, bounded by zig-zagging split rail fences. These birds, I later learned, were probably descendants of the vultures that took up residence in a War Department tower that once stood on the Big Round Top boulder so they could make a feast of the dead horses that littered the battlefield back in the summer of 1863. Gettysburg now hosts a resident population of close to a thousand black and turkey vultures, and on this day seventeen of them had assembled over the car-struck carcass of a white-tailed deer. The vultures seemed to be in no hurry, but perhaps these shy creatures were simply awaiting an opportunity to safety descend the berm, unfretted by passing automobiles and leering humans. It was, I think, a preferable rendering for the poor deer, whose remains likely would have ended up in the back of a public works truck destined for the dump. American vultures are pretty much limited to such happy finds these days, but in other cultures and other times they have been appreciated for their efficient dispatching of corpses. Tibetans traditionally have offered their dead to the vultures in a form of corpse disposal called jhator, or giving alms to the birds. Some believe the vultures to be dakinis, minor female deities of wrath or beneficent disposition. A dead body might be left in a remote area for scavengers or to decay naturally, but families who are able to afford it opt for a ceremony in which a butcher is employed to dismember the corpse with an ornate, curved flaying blade called a kartika, and distribute the limbs and organs to waiting vultures. In the jhator ceremony, the vultures sit on nearby rocks like well-trained, if impatient, dogs until the butcher calls to them. American vultures, for wont of such veneration and ceremony, have learned to pick through our trash. Nature’s undertakers are now nature’s dumpster divers. The day I happened by the landfill, a wake of buzzards had amassed on the north side nearest the road. That part of the dump had been recently been turned up by earth movers that now sat silent at the end of the workday and provided prime perches for the vultures. As I stepped around the closed gate to get a better look, a county employee pulled up in his truck to ask if he could help me. “Just bird watching,” I told him, which elicited a laugh and the suggestion that I take some vultures home with me. I would, I thought. I would if I weren’t a vegan without scraps of dead things to toss them. I would be thrilled if one morning while I sat looking out my kitchen window with my coffee and my Audubon’s Guide to Backyard Birds, a few hulking, hissing vultures joined the chickadees and purple finches at the feeders. In truth, the dump may be the closest thing we have to a charnel ground. It’s filled not with our dead (hopefully), but with the detritus of all the species we use and discard: in addition to roadkill, it is the final resting place of the thousands of homeless dogs and cats “put to sleep” in the local shelter each year, as well as those companion animals who go in the front door of the vet’s office and out the back to a “city burial.” It’s filled with meat and bones and mice in traps and poisoned rats and the unknown contents of plastic garbage bags. Like the county worker who stopped to investigate my suspicious loitering, many people place vultures in the ever-expanding “rats with wings” class of fauna. In neighborhoods surrounding the Parsi Towers of Silence, residents complain of dropped body parts. In neighborhoods surrounding the Orange County landfill, residents complain, rightfully so, of being stiffed with affluent Chapel Hill’s waste and the environmental consequences of a landfill built at their back stoops. They complain, too, of the vultures perched on power lines, but that seems to be more an issue of the willies than a health hazard. In one Florida community, the Solid Waste Authority was so vexed they took to shooting the birds, until the county commissioners voted to look for non-lethal means of deterring them. A biologist in Ohio has found that making effigies of dead, stuffed vultures, displayed both “supine and hanging,” bummed out live vultures enough to cause them to disperse. For an update on the status of the critically endangered California condor, visit http://www.audubonmagazine.org/articles/birds/soaring-over-brink-california-condor.